Jedi weapons often have great stories -- and meaning -- of their own. 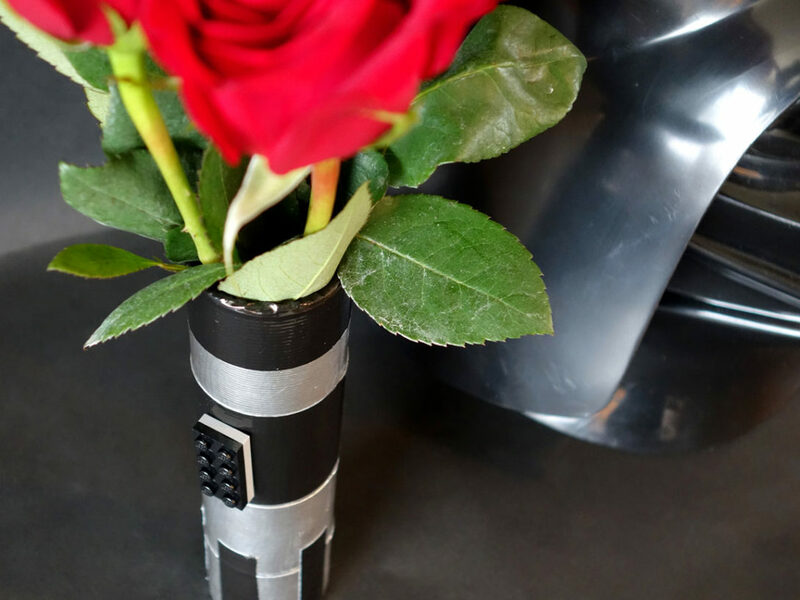 “An elegant weapon for a more civilized age.” Obi-Wan Kenobi’s description of the lightsaber’s role as an ally of a Jedi Knight in A New Hope proved to be succinct and accurate. A Jedi’s training involved the crafting of one’s own lightsaber, and the duty of every Jedi Knight included protecting the iconic weapon. Unfortunately, throughout the Star Wars films, many sabers suffered the fate of being lost or destroyed in the heat of battle. In other cases, Jedi would take up a lightsaber that was not their own. 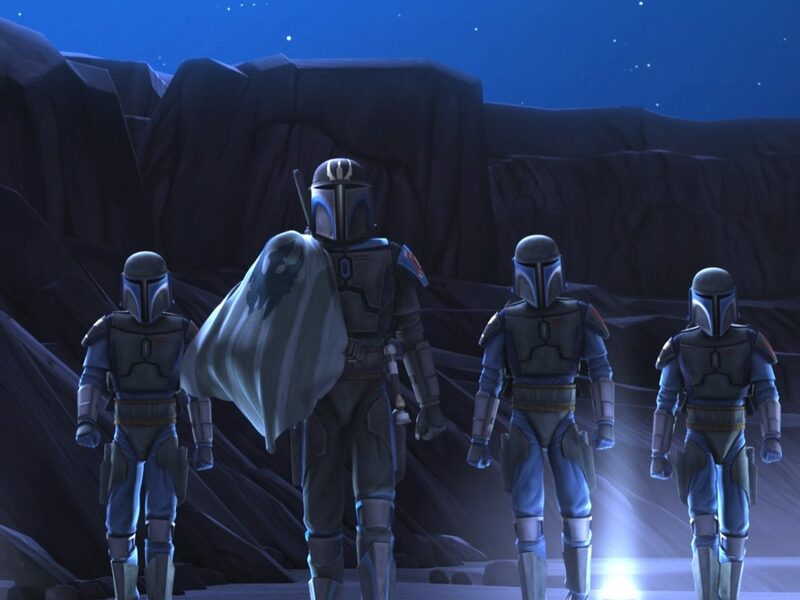 Such incidents occurred in the lives of many prominent Jedi and often marked a significant development in the paths of those Jedi and the saga. Ironically, the first two Jedi to be examined each only used a single lightsaber on-screen. 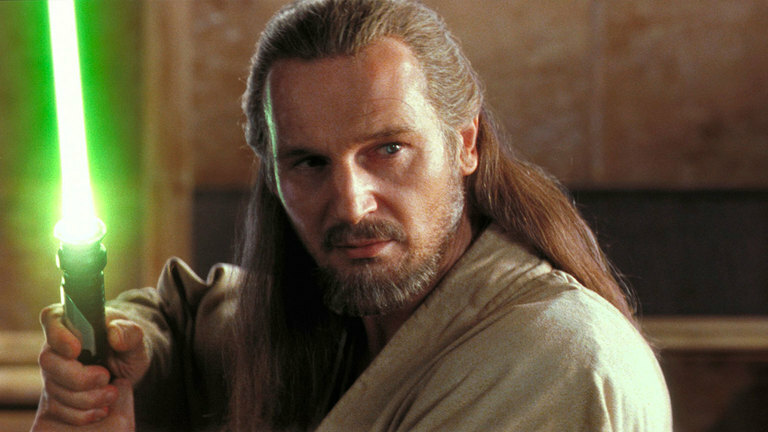 Qui-Gon Jinn utilized his lightsaber during the events of The Phantom Menace, ultimately losing his life in a duel with Darth Maul. Qui-Gon’s death clearly signaled the end of his journey with his saber, and Obi-Wan picked up his fallen Master’s weapon to defeat Darth Maul. Obi-Wan’s actions with his friend’s blade symbolized his assumption of Qui-Gon’s role as Anakin Skywalker’s teacher. Another transition identified by the loss of a lightsaber followed the battle between Yoda and Darth Sidious. After being disarmed in combat and falling to the Senate floor, Yoda retreated from the building and sought refuge on Dagobah. The separation from his lightsaber delineated Yoda’s passage from renowned Jedi Master to galactic exile. 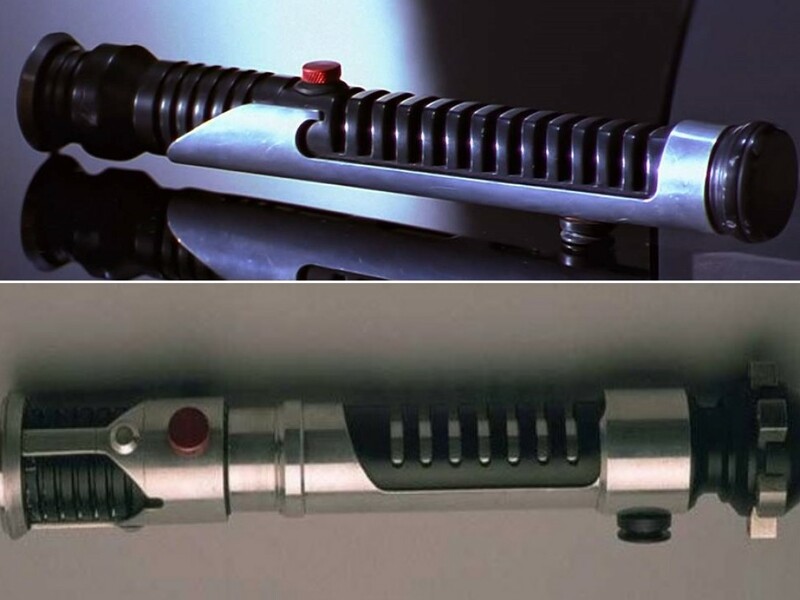 Obi-Wan built his first lightsaber as a Padawan learner, but Maul disarmed him during their fight on Naboo. As previously mentioned, Kenobi’s use of Qui-Gon’s weapon represented his choice to replace Qui-Gon as Anakin’s Master — literally carrying on where his Master left off. However, rather than continue using a fallen Jedi’s blade, Obi-Wan constructed a new lightsaber that signified his advancement from Padawan to Jedi Knight. Count Dooku captured this saber on Geonosis, forcing Kenobi to borrow a weapon during the ensuing battle on the planet. The sudden arrival of the Republic fleet ended the peace and initiated the chaos of the Clone Wars, but it also reflected the ad hoc nature of Obi-Wan’s use of an appropriated blade to hold him over until a new one could be constructed. The process of creating his third lightsaber coincided with Kenobi’s ascension to Jedi Master. 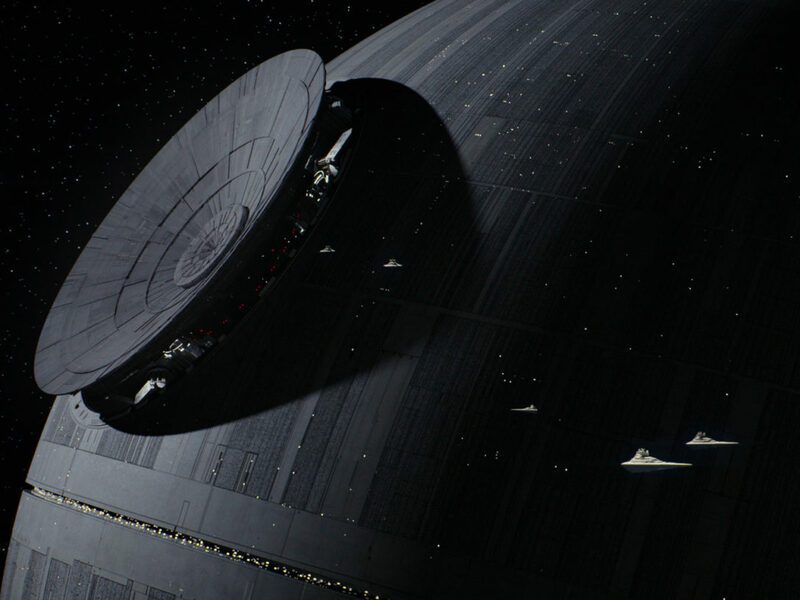 Obi-Wan battled his former apprentice on Mustafar before going into exile, and the saber faced Darth Vader once again aboard the Death Star. As Kenobi retracted his blade and allowed himself to be struck down by Vader, the action symbolized his final act of placing his faith in the strength of the Force at the time of his death. Anakin Skywalker endured similar struggles with maintaining ownership of his lightsabers, but a shadow of darkness seemed to constantly follow each blade. Skywalker assembled his first weapon as a Padawan, but its innocence was short-lived as Anakin’s hand employed it to slaughter the band of Tusken Raiders responsible for kidnapping his mother. Eventually, industrial machinery destroyed the saber in the droid factory on Geonosis. 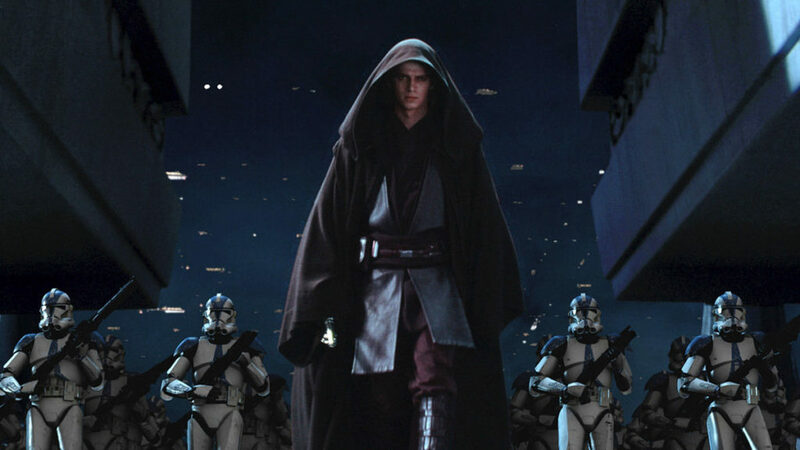 Anakin commandeered a temporary blade for the Battle of Geonosis and ended up utilizing both of the weapons he and his Master had borrowed to face off against Dooku. As the duel evolved and Obi-Wan became incapacitated, Skywalker stood alone in the fight and displayed signs of anger as he lashed out toward the count. Dooku sliced the green saber procured by Anakin in two and severed the young Jedi’s arm soon after. The engagement marked the beginning of Skywalker’s transition from man to mostly machine. 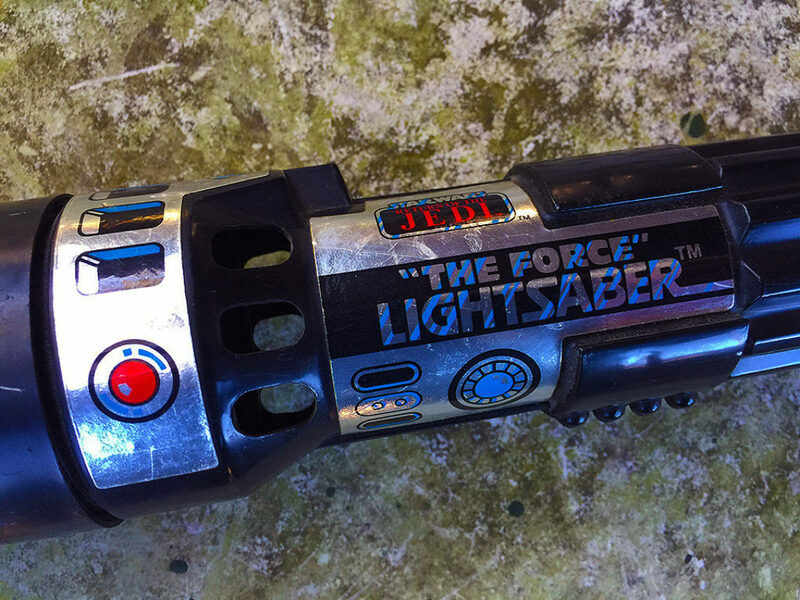 Anakin built a new lightsaber at a time that coincided with his advancement beyond the status of a Padawan. During the Battle of Coruscant, Skywalker utilized the blade in conjunction with Dooku’s own saber to slay the count. The murder of Dooku may not have been the earliest moment Skywalker and his weapon fell prey to the darkness, but it featured Anakin’s first use of a Sith’s red lightsaber. Holding his blue saber and Dooku’s red weapon at the same time was a striking symbol at the battle of good and evil impulses that were raging inside Anakin. Skywalker’s descent continued when he committed some of his most heinous acts, such as becoming Darth Vader and assisting in the slaughter of young Padawans at the Jedi Temple. 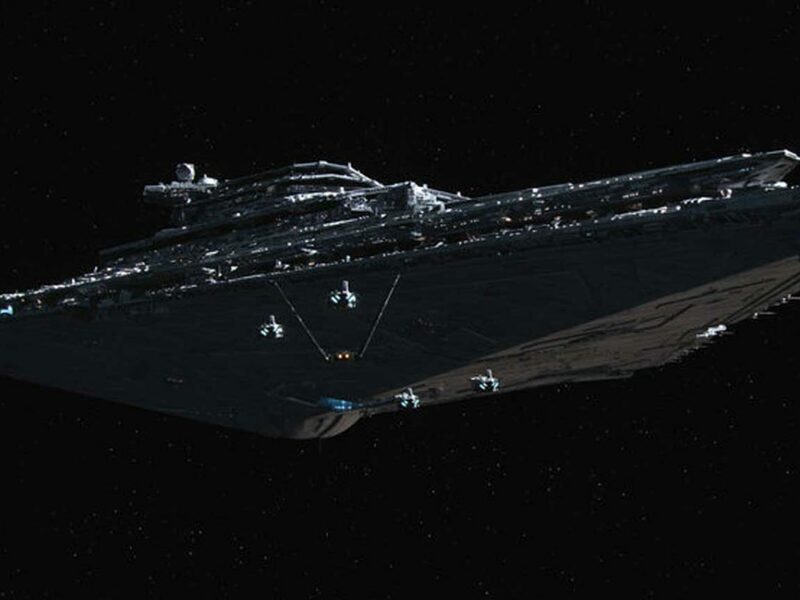 The same lightsaber accompanied Vader to Mustafar where he fought Obi-Wan, and Kenobi’s inability to save his apprentice led to the latter’s severe disfigurement. Obi-Wan took his former friend’s weapon, signifying the true end of Anakin Skywalker. Darth Vader eventually crafted a red blade as part of his transition into a Sith Lord; Vader carried the weapon during his tenure with the Galactic Empire, and the loss of that lightsaber on the Second Death Star coincided with his redemption and rebirth as Anakin Skywalker. 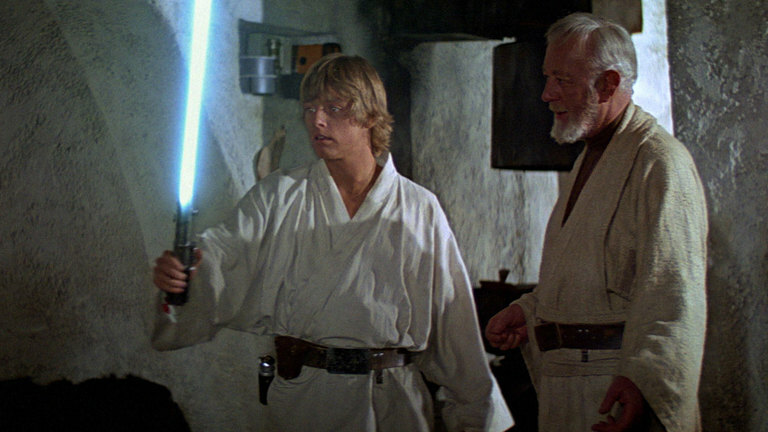 Obi-Wan Kenobi famously gave the lightsaber he had taken from Darth Vader at Mustafar to Anakin’s son Luke Skywalker. The gift set Luke’s training in motion, first with Kenobi en route to Alderaan and later with Yoda on Dagobah. The transfer of ownership indicated that, since Anakin no longer seemed to be the Chosen One, the only hope for the Jedi rested in Luke’s hands. 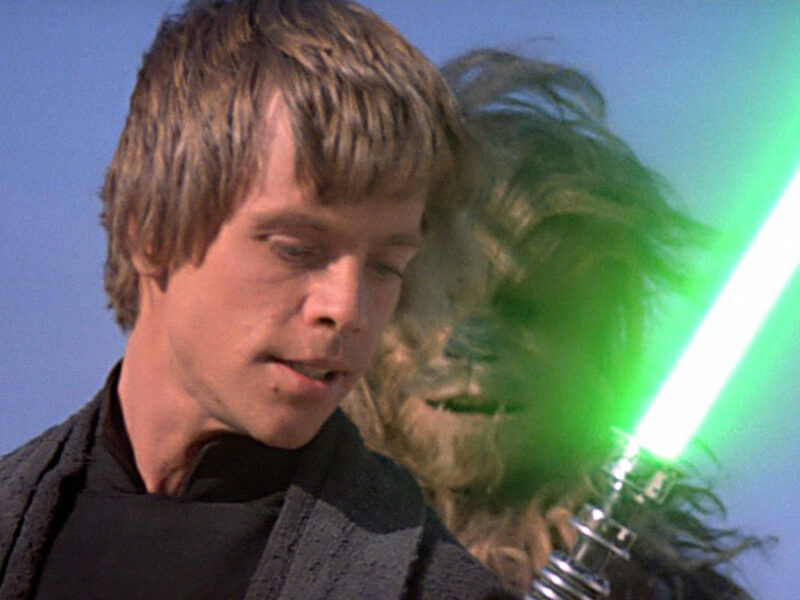 Luke chose to forego additional lessons and confront Darth Vader with this blade on Bespin, where it fell into the labyrinth of Cloud City after Vader severed Luke’s limb with a swift cut. When combined with the revelation that Vader sired Luke, the loss of the old lightsaber paralleled the extinguishment of Luke’s innocence upon learning his father’s true fate. Luke continued his education in the ways of the Force, assembling a new lightsaber in order to complete his journey to become a Jedi Knight. Luke fulfilled his destiny and battled Vader with the saber on the Second Death Star, ultimately finishing his training and reigniting the light inside of Anakin Skywalker. The lightsaber which fell into Bespin’s depths somehow made it into the hands of Maz Kanata on Takodana, where it once again set a Force-sensitive youth on a new path. Rey’s discovery of the historic lightsaber prefaced a series of voices and visions that frightened her into running from Maz’s and led to her capture by Kylo Ren. With help from Finn, Rey encountered the blade again at Starkiller Base. Once Rey accepted her abilities, she summoned the lightsaber with the Force and bested Kylo in combat. Knowing to whom the saber previously belonged, Rey set out to find Luke Skywalker and potentially add new chapters to that particular lightsaber’s legacy. 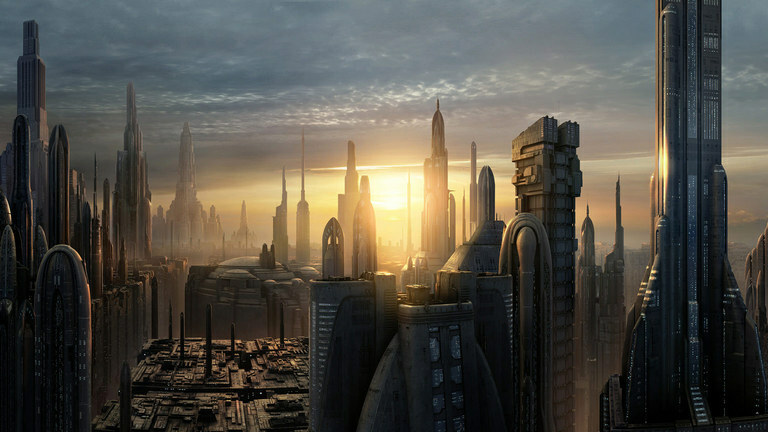 Lightsabers followed their owners as they rose from Padawans to Masters, and even from righteousness to the dark side. Anakin Skywalker’s final blue blade seems to have had the most interesting lineage thus far in the Star Wars films, and Rey offering the saber to Luke with an outstretched hand in The Force Awakens has been seared into the minds of fans around the globe. Episode VIII can’t arrive soon enough. 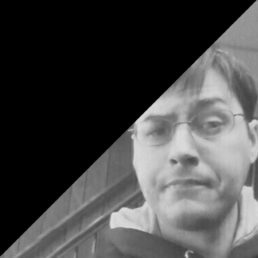 Jay Stobie is a science fiction writer who admits he has a perfectly normal obsession with Star Wars, Star Trek, and the various starships that inhabit those two universes. He can be found on Twitter at @CaptStobie.